The Nature Conservancy is doing what it can to help struggling state parks like Humboldt Redwoods on the north coast. Ghostly albino redwoods have been appearing on the floor of California forests, only to vanish without a trace. Now, researchers at Stanford and UC Santa Cruz are hot on the trail of this ecological mystery. Teams of scientists have been collecting samples for laboratory study. The albinos are unlike any other redwood, with waxy needles and frail bark. They grow quite slowly, and have narrow vessels for carrying water. The albinos can't survive on their own, and require a parent tree to supply additional nutrients. Redwoods tend to reproduce by sending up new shoots from their roots, and the albinos are a rare variation. it's unusual behavior for a plant that has evolved to take advantage of its natural surroundings. There's no known benefit to developing an albino mutation, but it's possible that the albinos might have some unknown advantage in extreme environmental conditions. One explanation may lie in the trees' complex genetics. 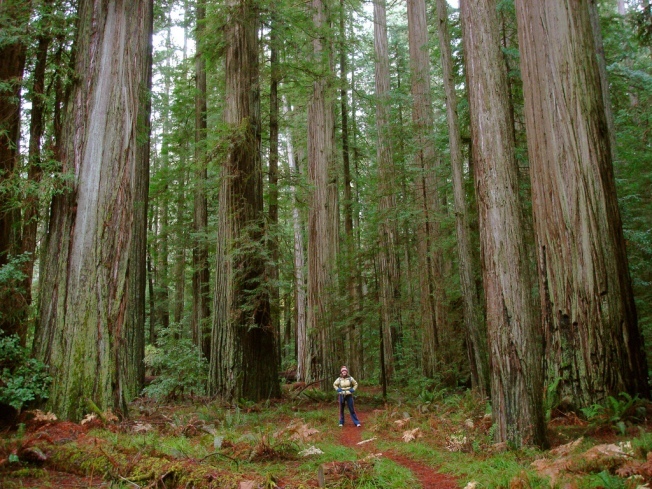 Redwoods have 66 chromosomes, whereas humans have only 23. No other evergreen produces an albino variety, and scientists don't know why the white trees have been showing up. Only about 60 are known to exist, and their locations are kept strictly secret. The lack of pigmentation makes them particularly vulnerable, since chlorophyll is instrumental in generating energy in plants. Keeping the trees hidden from public view is probably the best way to preserve them -- particularly at this time of year, when humans' thoughts turn to axes.